Deco Series Plaques "10" x 10"
Brushed Aluminum Plaque - 6" x 8"
Acclaim Plaques - 9" x 9"
About this Floating Glass Plaque - 8 x 10:Can be displayed via wall mount or stand alone. Steel loop stand included. Available in 2 colors. About this Glass Plaque with Pin:6"w x 8"h stand-alone plaque. Modern coordinated Brass or Silver pin. Material: Float Glass NOTE: Product comes with Prop 65 warning label when shipped to California. Label reads: "WARNING: This product may contain carcinogen, which is known to the State of California to cause Cancer and Reproductive Harm. For more information, go to www.P65Warnings.ca.gov. About this Deco Series Plaques 10 x 10:The Deco Series Plaques feature clear acrylic imprint panels that are held in place with decorative chrome hardware and mounted over hand swirled metal plates. About this Certificate Holder Clear on Black - 8 1/2 x 11 Insert:These certificate holders are held together with four plastic screws and are supplied unassembled for certificate insertion and are made with either clear over black or clear over clear acrylic. About this PhotoImage(R) Acrylic Plaque - 8 x 10:PHOTOIMAGE® Full COLOR. This plaques utilize a state of the art printing process to create beautiful but economical four color graphics. The printing is on the backside so that the images appear to float inside the plaques. PhotoImage® Plaques are also available with Digital Personalizations or variable data copy together with the Full color process imprint.﻿Special Instructions:Personalization Option Avaliable, Please Call for Service. About this Magnetic Certificate Holder - Clear on Black - 8 1/2 x 11 Insert:These unimprinted certificate holders consist of a beveled black or clear acrylic backing and a beveled clear acrylic top piece which are held together with powerful magnets and ship without inserts in a Gift Box. About this Brushed Aluminum Plaque - 6 x 8:These plaques feature a finely brushed aluminum plate over beveled black acrylic with an elevated clear acrylic imprint panel and decorative chrome hardware.Special Instructions:Personalization Option Avaliable, Please Call for Service. About this Brushed Aluminum Plaque - 8 x 10:These plaques feature a finely brushed aluminum plate over beveled black acrylic with an elevated clear acrylic imprint panel and decorative chrome hardware.Special Instructions:Personalization Option Avaliable, Please Call for Service. About this Alumo - Tech II Plaque - 8 x 10 x 1:The Alumo Tech plaques feature decorative swirled aluminum mounted on black acrylic.They have an elevated clear acrylic imprint panel which is held in place with decorative chrome hardware.Special Instructions:Personalization Option Avaliable, Please Call for Service. About this Sublimated Plaque 6 x 8 vertical:These rich sublimated plaques are perfect for awards and recognizing goals.The sublimated plaque prints in full color on a white, gold or silver metal plate.Imprints are semi-transparent, base metal may show through the colors.White ink cannot be printed.The metal plate then adheres to a handsome black wooden base which can be hung on the wall or stood on a desk. Material: Wood, Aluminum. About this Wood 34 Award:Piano wood finish in jet Black; 6" x 8" Blue/Gold marble textured plate, lasered. Gift box included. Due to this product's variance in composition, laser engraving may produce different shades of imprint. About this Acclaim Plaques - 9 x 9:These plaques feature a combination of Swirled Metal side plates and Brushed Metal interior plates for the background.Your ad copy is placed in the center on a clear acrylic panel held in place with decorative chrome hardware. About this Sublimated Plaque 8 x 10 vertical:These rich sublimated plaques are perfect for awards and recognizing goals.The sublimated plaque prints in full color on a white, gold or silver metal plate.Imprints are semi-transparent, base metal may show through the colors.White ink cannot be printed. The metal plate then adheres to a handsome black wooden base which can be hung on the wall or stood on a desk. Material: Wood, Aluminum. About this Fashion Stone 2 Award:Rosewood frame, suede top and accent mats, 5" x 3" Black granite medallion with sand etch & Gold Colorfill 4" x 2" gold aluminum plate, sublimated. The Magnetic Certificate Holder - Clear on Black - 8 1/2" x 11" Insert is a great item to give with certificates or awards in them. It helps preserve the quality of the award. You won’t have to worry about an award wrinkling with this Magnetic Certificate Holder. These unimprinted certificate holders consist of a beveled black or clear acrylic backing and a beveled clear acrylic top piece which are held together with powerful magnets and ship without inserts in a Gift Box. Thank you Maxwell, Justin and Kate. We’re happy to read your positive reviews on our promotional 6x12 Connection Plaque - Rosewood. 6x12 Connection Plaque - Rosewood is a perfect item to give to a recipient. It’s classic look makes it the perfect plaque. A modern take on the classic plaque. The silver plate adds a touch of sophistication! Can be displayed via wall mount or stand-alone. Surface-mount medallion optional; milled medallion not available. Order your 6x12 Connection Plaque - Rosewood here. Thank you Cole and Colby for your reviews. We’re glad to see positive feedback on our custom Acrylic Plaque. 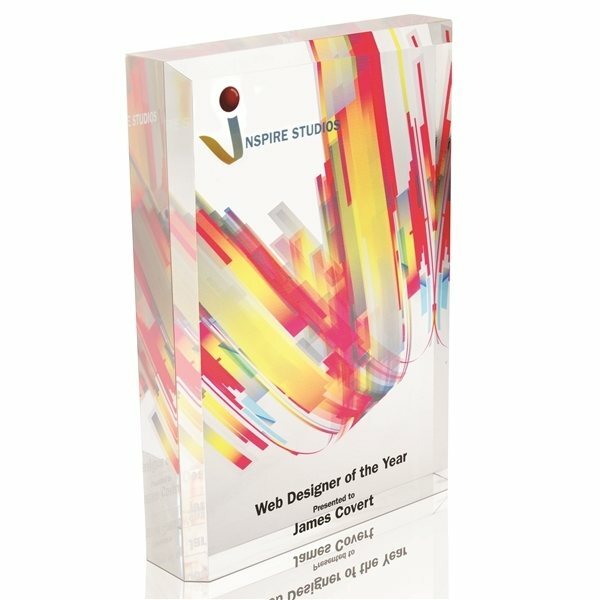 The Acrylic Plaque can have a design that’s so beautiful, your recipient is going to love it! Don’t miss out on rewarding with this acrylic plaque. Create a 3D effect by imprinting both back and front sides. 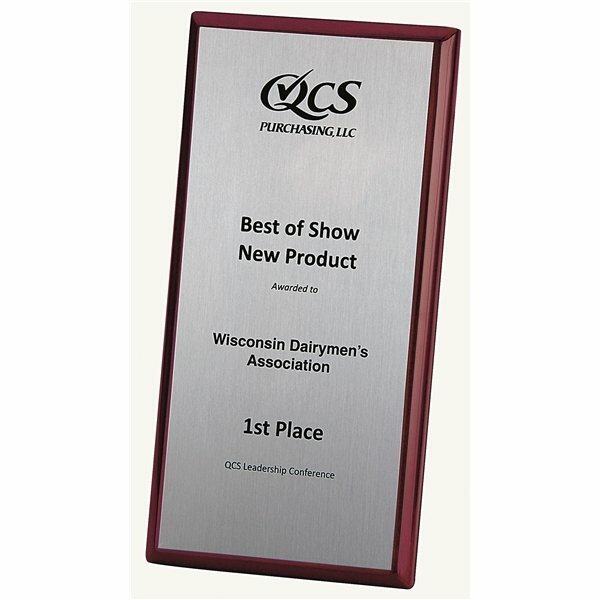 Free-standing plaque with a large imprint area. In our wide selection of custom plaques, you’ll find the most fitting to match your company needs. We have acrylic plaques, black plaques, wood plaques, aluminum plaques, sublimated plaques, marble plaques, and more! Want to create a personalized plaque? Our selection offers top quality plaques, elegant plaques and basic plaques. Give your employee, coach or customer a plaque to cherish. Customized plaques are more personal when given as an award. Recognize your recipient/s with a custom plaque from our selection. Here at AnyPromo, we always aim to make your event a huge success! Search our plaques selection to find what best fits your event’s needs. Make your recipient feel special with a custom plaque. Plaques are great to recognize that overachiever! We have different types of plaques available in our selection. Make your recipient remember their recognition with a custom plaque. Below you’ll find a list of some of our trending custom plaques. Every item is available and waiting for you to order. Alumo-Tech II Plaque - 8" x 10"
Brushed Aluminum Plaque - 9" x 12"
Delphos Vertical or Horizontal Plaque10"
Delaware Optical Crystal Plaque 7"
Custom plaques are personal awards to give to your recipients. Giveaway custom plaques to make your recipient feel more special! Seeing their name on the plaque will only make them smile. Have any questions regarding our custom plaques selection? Live chat with one of our customer service representatives to help answer all your questions! They are standing by ready to help you! Our featured list of plaques are trending in this category. You won’t want to miss out on checking these options!